Supplementary material reads: "The Bernard Company, Public Relations, 449 South Beverly Drive, Beverly Hills, California. News release. 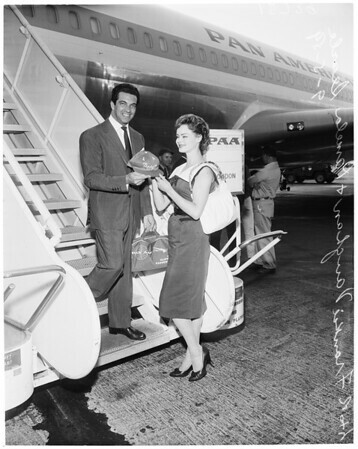 Frankie Vaughan, England's top vocalist and show business personality, arrives at International Airport on his way to Las Vegas where he opens at the Dunes September 10, the first time an English singer has headlined Vegas. Welcoming Vaughan to Los Angeles with a Los Angeles Dodgers baseball hat is Pamela Searle, Miss England. This is Vaughan's first trip to the West Coast".